This page includes the macrobiotic definition, foods and explores all aspects of macrobiotics. a system of holistic principles and dynamic practices that guides choices in nutrition, activity, and lifestyle for physical, emotional, mental, social, and environmental health. – macrobiotic, adj., such as macrobiotic philosophy or macrobiotic diet. Origin: from Ancient Greek: Makros (large or long), Bios (life or way of living), and Thiké (technique or art of). First used by German physician Christoph von Hufeland (1762-1836) in his book title translated in English as: Macrobiotics or the Art of Prolonging Human Life. Definition agreed upon by the International Macrobiotic Conference 2017 in Berlin by 45 teachers, representing many schools, institutes, and organisations. Revised November 2018. Definition agreed upon by the International Macrobiotic Conference 2017 in Berlin, with 45 macrobiotic teachers, along with GOMF, Macrobiotic Association, Chi Energy, SHI, IMP, IME, IMS, and other schools, institutes, and organizations. The macrobiotic foods are those eaten by the worlds most healthy societies and uses as many natural ingredients as practical that come straight from a farm rather than a factory. The general approach to eating mirrors those diets of Okinawa, rural China, and Mediterranean countries. Eating whole living foods means you eat the energy of the foods along with all the nutrients. This living energy nourishes your own life force and helps you feel lighter, happier and more content. This would include vegetables, whole grains, beans, fruit, nuts, seeds and herbs. Many people have claimed to recover from serious illness by eating macrobiotically but for most it is the ultimate healthy diet and one that is flexible, open, tasty and can be quick to prepare. The chart above provides a complete macrobiotic definition. It describe how macrobiotics can be practiced as a diet, philosophy, consciousness or body of knowledge. You may start at any point on the circle and explore the areas of macrobiotics that most appeal to you. Over time, try to experience all aspects of macrobiotics to fully benefit from this holistic approach to health. The following principles and values are based on the writings of the early twentieth-century philosopher George Ohsawa. His and our intention is to cultivate individual and world health, social and environmental consciousness, and a fulfilling life. Here they are written concisely in modern language. Books, websites, and social media have material for further study. Gratitude – Developing a love of life, making the most of every moment, and being grateful for whatever happens whether it seems positive or negative, is an opportunity to grow. One grain, ten thousand grains – In nature, one seed becomes a plant that produces many seeds, thus giving back and increasing. This is a metaphor to continuously act with generosity towards others in all aspects of life, thus giving back more than you receive. Values – Learning to accept people as they are and appreciate each person’s life journey. Seek to make honest and positive relationships that fulfil the highest ethics and values in life. Everything changes – By embracing change, humans develop. Macrobiotic living is a way to create beneficial change in life, evolving through experience and as the world changes. Seven conditions of health – 1.Vitality. 2. Good appetite for natural food and life. 3.Deep refreshing sleep. 4. Good memory. 5.Cheerful pleasant outlook. 6.Clear thought and action. 7.Honesty and appreciation. Self-reflection – Developing the ability to view life from the biggest perspective from a more objective and non-judgemental place. Living with self-awareness can guide each person toward health. Intuition – An integral part of health, based on an inner knowing, that comes from a direct connection with nature and beyond. Self-empowerment – The ability to influence your own life and health is one of the first steps to empowering yourself, leading to a creative, constructive approach to life. Body and nature are not separate – What we do to the environment greatly affects us. Food and breathing are our direct connection to nature. Through daily meals, regular rising and sleeping times, and daily exercise, we realign with the seasonal cycles of nature every day. Food – Consistent mealtimes and eating together promote health. A macrobiotic diet is based on combining healthy traditional food, including fresh vegetables, whole grains or their products, beans, fruit, nuts, seeds, pickles, fermented foods, herbs, seasonings, sea vegetables, and teas. Each person is unique and discovers the best food for health based on macrobiotic principles. Many thrive being vegan and some choose to include a little animal food. 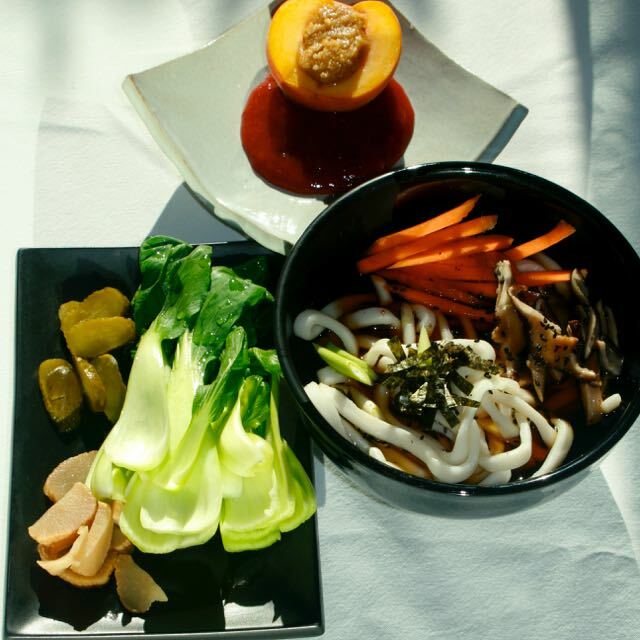 Macrobiotics is an open, flexible, and adaptable approach to eating that can include a wide variety of foods for social events and special occasions. Principles for food selection – Prioritise food that has grown and adapted to your climatic region over many centuries or at least comes from a similar climatic zone. Prefer local and seasonal perishable foods from as close to home as possible and organic/natural foods with as little chemical additives as possible. Our food choices impact society and the environment. Natural preparation – Use natural preparation, cooking techniques, and preservation methods to enhance the taste and quality of ingredients and to make nutrients more available. Cooking is a skill that can bring greater sensory and emotional satisfaction to each meal. Order of the universe – Describes the way things comes into being in a logical progression through seven stages. This process forms the philosophical basis of macrobiotics. Unifying principle of yin-yang– Illustrates the unity and diversity of all phenomena, connections and the relative direction of all things. Yin or yang cannot exist or be defined without the other. They are relative terms where things are more yin or more yang relative to something else. Opposites, such as day and night, complete and change into each other. Five transformations – Phases of change based on times of day and seasons that combine with yin and yang for further insight and refinement in making daily food, cooking, health, and lifestyle decisions and choices. Living with curiosity – Learning to think for yourself. 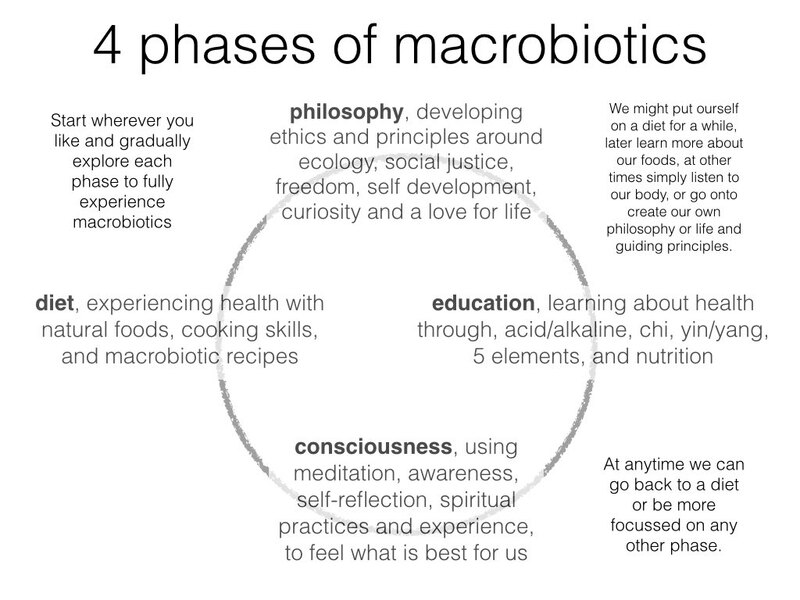 Macrobiotic education includes asking questions and developing curiosity to help explore life more deeply. Live with a beginner’s mind that is open to new and fresh ideas. Be ready to experiment and verify them for yourself. Study traditional cultures that have achieved health, longevity, and harmony with their environment. Seven aspects of consciousness – Helpful guides for self-reflection as we grow and develop. These innate human qualities are physical, sensorial, emotional, intellectual, social, philosophical, and universal love that can turn antagonism into its complement. Authors: Simon Brown, Carl Ferre, Anna Mackenzie, Isabel Moreno, Denny Waxman. The authors would like to thank and acknowledge the many people who sent thoughtful contributions, including Ana Luísa Bolsa, Mike Chen, Flora Laurent, Kristiane Ravn Frost, Micheal Rossoff, Lino and Jane Stanchich, Bill Tara, Nigel Walker, and Melanie Waxman. Principles and Values agreed upon by the International Macrobiotic Conference 2018 in Lisbon by 50 teachers, representing many schools, institutes, and organisations. 1 Ohsawa, George. Cancer and the Philosophy of the Far East. Chico, California: George Ohsawa Macrobiotic Foundation, 1981, page 121. 2 Ohsawa, George. Essential Ohsawa. Chico, California: George Ohsawa Macrobiotic Foundation, 1994, page 40. 3 Ohsawa, George. Practical Guide to Far Eastern Macrobiotic Medicine. George Ohsawa Macrobiotic Foundation, 1976, page 99. 4 Ohsawa, George. Order of the Universe. George Ohsawa Macrobiotic Foundation, 1986, page 42. 5 Ohsawa, George. Essential Ohsawa. George Ohsawa Macrobiotic Foundation, 1994, pages 35-41. 6 Ohsawa, George. Macrobiotic Guidebook for Living. George Ohsawa Macrobiotic Foundation, 1985, page 115. 7 Ohsawa, George. Unique Principle. George Ohsawa Macrobiotic Foundation, 1976, page 20. 8 Ohsawa, George. Essential Ohsawa. George Ohsawa Macrobiotic Foundation, 1994, pages 30-31. 9 Ohsawa, George. Unique Principle. George Ohsawa Macrobiotic Foundation, 1976, page 265. 10 Ohsawa, George, edited and appended by Herman Aihara. Macrobiotics: An Invitation to Health and Happiness. George Ohsawa Macrobiotic Foundation, 1971, pages 24-27. 11 Ohsawa, George, edited and appended by Herman Aihara. Macrobiotics: An Invitation to Health and Happiness. George Ohsawa Macrobiotic Foundation, 1971, page 26. 12 Ohsawa, George, edited and appended by Herman Aihara. Macrobiotics: An Invitation to Health and Happiness. George Ohsawa Macrobiotic Foundation, 1971, pages 48-54. 13 Ohsawa, George. Essential Ohsawa. George Ohsawa Macrobiotic Foundation, 1994, pages 131-144. 14 Ohsawa, George. Essential Ohsawa. George Ohsawa Macrobiotic Foundation, 1994, pages 105-130. 15 Ohsawa, George. Acupuncture and the Philosophy of the Far East. Boston, MA: Tao Books and Publications, Inc., 1973, pages 15-26. 16 Ohsawa, George. Essential Ohsawa. George Ohsawa Macrobiotic Foundation, 1994, pages 87-88. 17 Ohsawa, George. Essential Ohsawa. George Ohsawa Macrobiotic Foundation, 1994, pages 73-76. You are welcome to call Simon on 07543663227 or email to discuss the different ways Simon can help you try out macrobiotics.